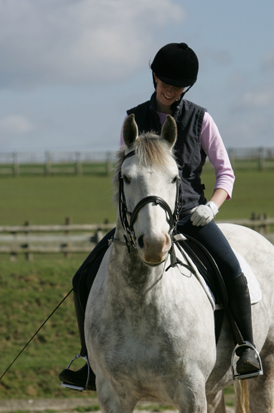 Sound Schooling lessons can help if you've ever found it difficult to think up ideas for your schooling sessions, want to learn or practice new movements, or simply want to have an expert voice in your ear to add some variety, structure and discipline to your riding. You can purchase Sound Schooling's downloadable lessons from the View Downloads page. Lessons vary in length but are generally between 15 and 20 minutes long, to enable you to focus on a particular schooling area once you've warmed-up. Lessons are optimised for use in a 20m x 40m school. Listen to a taster sample lesson by British Dressage trainer and List 1 Kim Ratcliffe, by using the player below. We've also got non-ridden downloads, plus music to ride to by Tom Hunt, to add to our original Sound Schooling audio lessons. Once you've purchased a download from the website, you'll receive a link to the MP3 file. You will need to save the file onto your computer, then transfer it to your MP3 player (for example, by importing into iTunes). Our FAQs page will give you more information on this. If you've purchased a download for use whilst riding, once the audio download is on your MP3 player you're ready to listen to it. Make sure you're in a safe schooling environment - do not listen to audio lessons whilst hacking, make sure you can still hear external hazards and tuck your MP3 player headphone lead away so it can't catch on anything. Finally, if you're not using a Sound Schooling warm-up session, make sure you and your horse are properly warmed up before starting any of the schooling sessions. Visit our FAQs page for more details about Sound Schooling audio downloads. Did you know Sound Schooling also has a range of non-ridden downloads and music to ride to?